Sire: UH Trifecta's Shag-edelic*** MH CD WCX CCA VCX OS"Shag"
Penny had a litter of 7 puppies on her sixth birthday, May 28, 2011 -- 3 girls and 4 boys. The sire of this litter, Shag, is a handsome and very talented field trial competitor who is All Age Qualified and is still competing at age 8 1/2 on the tough field trial circuit. During the summer he has earned four Master Hunter passes and should complete his title by Fall. He is also ready to show in Open Obedience next winter, during his R&R time at home, where he is a much beloved house pet. Shag has sired several litters of puppies, all of which are still very young, but we expect to see some of them out competing during the coming years. 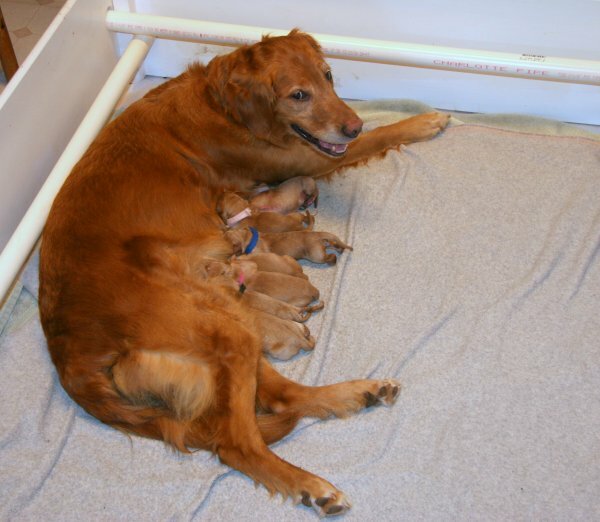 This is Penny's second litter. Her sire is the renowned Mr. Speaker who lived until just short of his 16th birthday. Her dam is our beautiful and brilliant Hilfy, who has had 26 outstanding puppies that are making names for themselves in field, obedience, search and rescue, agility, rally, and police work as well as family pets. 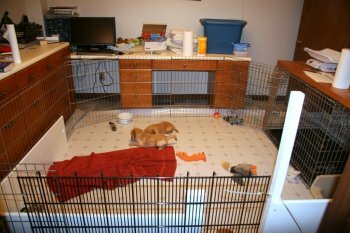 We expect this litter to grow up as smart, talented, sweet, cooperative, and highly trainable dogs that will excel in any working venue. To see a pedigree for this breeding, look here. 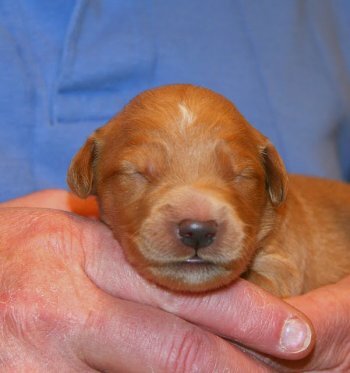 To see pictures and info about her last litter (11 puppies) and how those pups are doing, look here.
. 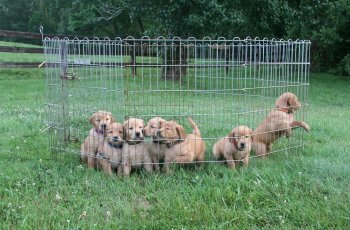 The "Puppies" links will take you to pictures and videos of puppies in groups. 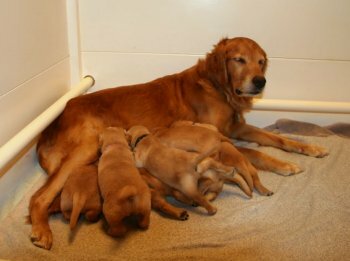 The puppy born first was the largest girl, the darkest puppy in the litter, and one of the biggest overall. 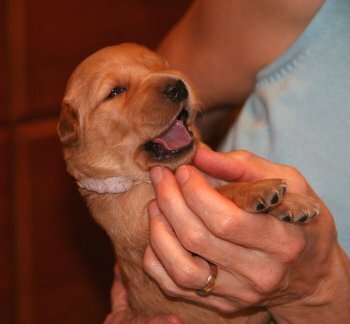 She is the one we picked to stay with us -- her cute wrinkly face, overall hunt potential, and sensible disposition convinced us that she was the one although it was a very hard choice. 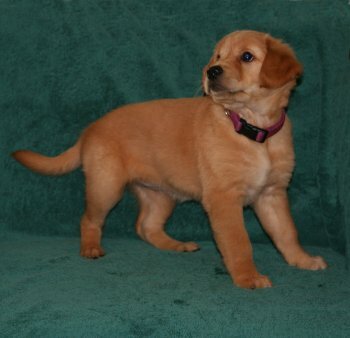 SHe is sturdy, charming, smart, playful, a little noisy, and athletic. We think her official name, Fern Hill Pandemonium, says it all! For more pictures and updates, see Pandy's page. 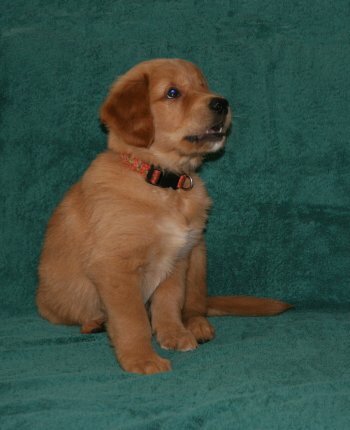 This is Pandy's 7 week old formal portrait. We think she is a lovely girl! He wandered off right after he was born, going exploring rather than starting to eat right away. Nothing changed as he grew up! He is bright, alert, adventurous, intensely interested in everything, and very social. 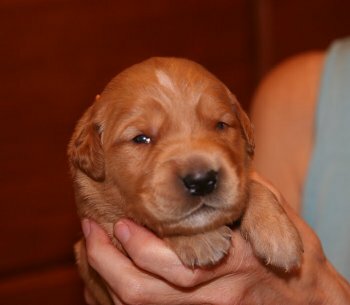 For more pictures and updates, see Scout's page. 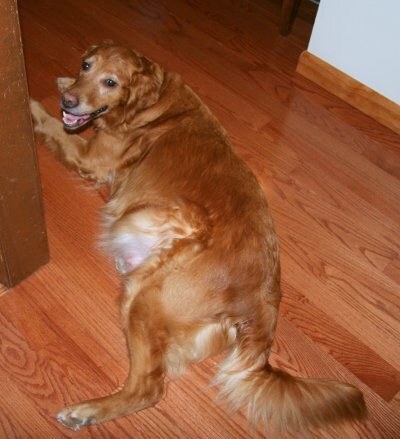 Scout went home to St. Louis, Missouri with the Helmkampf family. 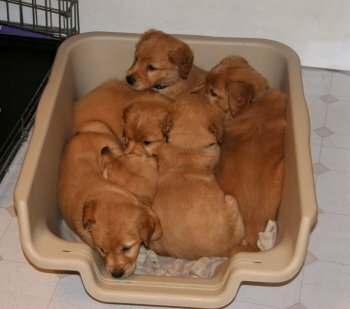 He is a present to Zach (far right in this picture) from his aunt and uncle, Nina Aversano and Larry Boudria, who own two other of our Fern Hill puppies. 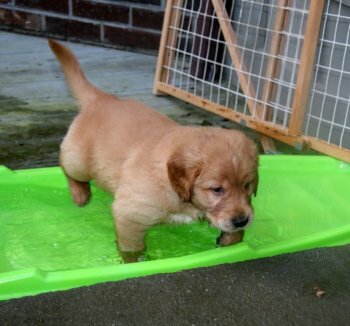 Scout is loving the pool at his new home and launches himself in at every opportunity! 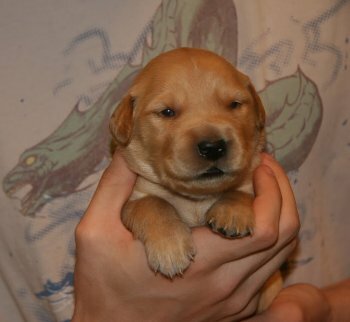 This puppy was a charmer from the first. Very well balanced, sensible, and pretty, with loads of talent and a very pretty face. For more pictures and updates, see Knox's page. 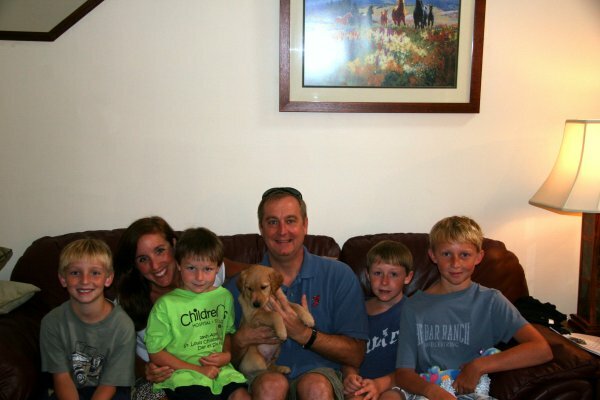 Knox traveled to Raleigh, North Carolina with the Roberson family. 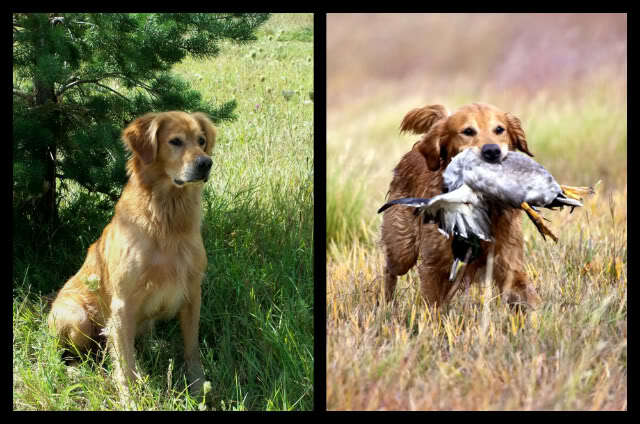 They like spending time at the beach and spend some time duck hunting as well. Knox is named after our nearest-by big city, Knoxville, TN, which is only 20 miles or so to the east of us. 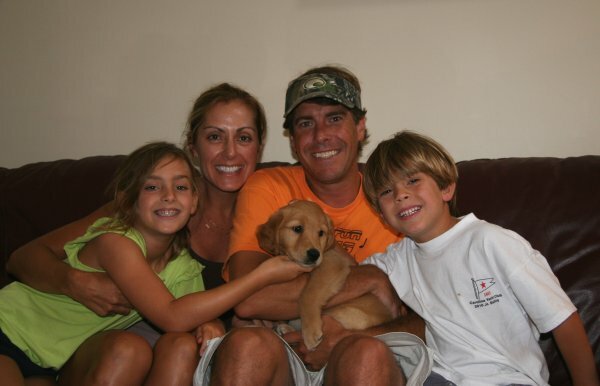 Our son lives in Raleigh, so we hope to see Knox and his family several times a year! 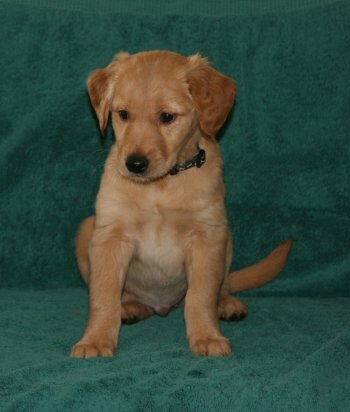 Molly just sparkles with her bright eyes and delightful personality. We got to keep her a few extra weeks waiting for her new family to come pick her up, and we quite fell for this charming girl. 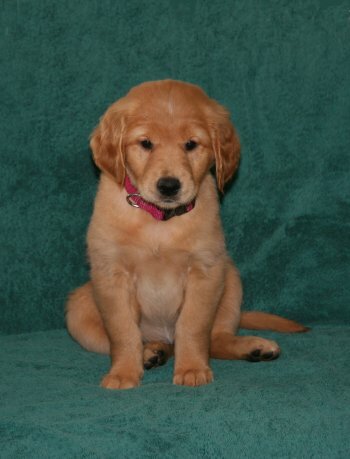 For more pictures and updates, see Molly's page. 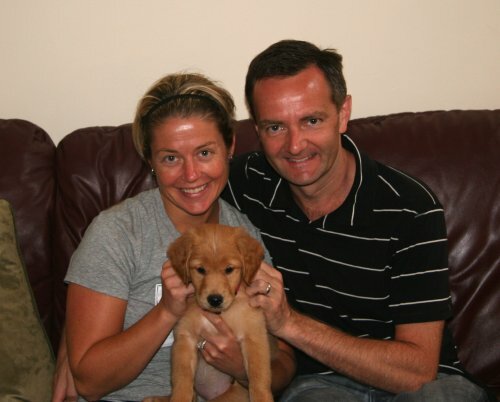 Molly will be leaving soon for New Jersey and Florida with her new family, the Shermans. 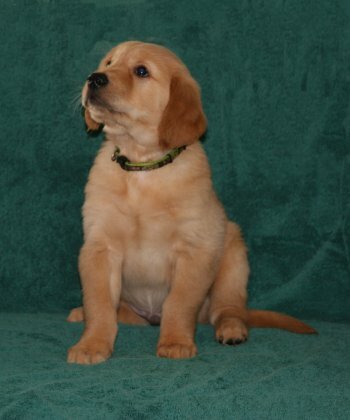 They have an older Golden who will be bringing her up right! 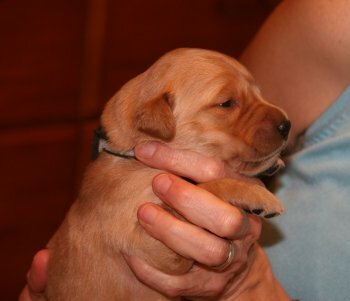 Ted, which is short for Fern Hill Theodore Robert, was the biggest puppy in the litter. Stout and handsome, he showed terrific potential for hunt and obedience -- and a very winning personality as well! For more pictures and updates, see Ted's page. 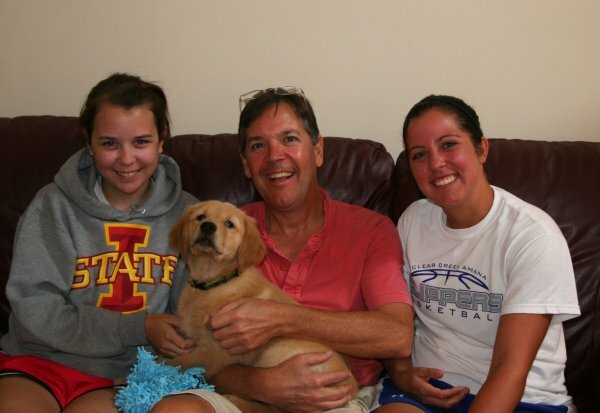 Ted went home with the Strub family of Iowa City, Iowa. Until this spring, the Strub's owned an uncle, a Speaker son, and are hoping that Ted will be as wonderful a pet as Bob was. Trip is looking forward to going hunting with him as well! 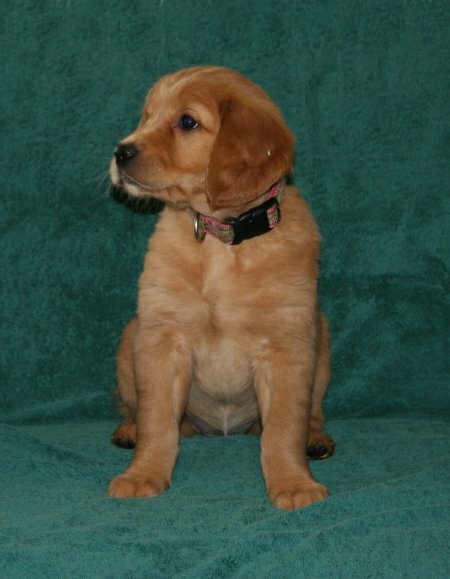 This girl was a very alert and charming puppy who showed great potential for any kind of working career, with the personality to be a really fun pet for an active couple. For more pictures and updates, see Charlie's page. Charlie now lives with the Soules, who are on a six-month assignment to Charlotte, NC before returning to their home in Boston. The Soules enjoy an active lifestyle and we predict that Charlie will be able to keep up with all their activities! Quirky and cute, this boy was a real hoot! Smart, talented, sweet, independent and ruggedly handsome, he also was one of the early escape artists. For more pictures and updates, see Pilot's page. 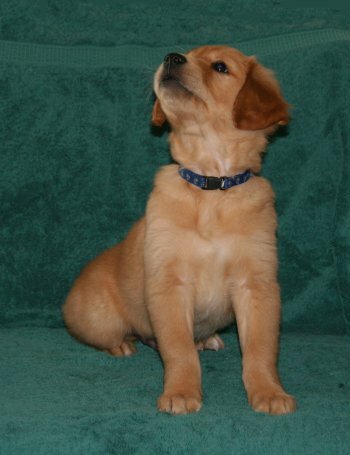 Pilot was the puppy selected to go to Southeastern Guide Dogs, where he will spend the next several years being evaluated as a potential stud dog in their Golden / Labrador breeding colony. First he will have to pass their rigorous training program and be able to get all his breeding clearances, so it will be several years before we know whether he made the grade or will end up in another career path. We are proud that he is being considered for this prestigious opportunity! Shown here with Southeastern trainer Jen Gerrity, who was Pilot's host during the two week quarantine period. 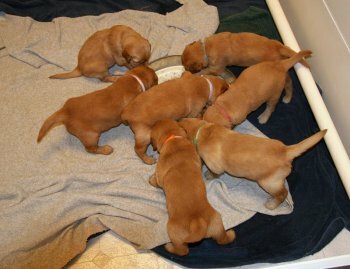 For more puppy pictures, visit our Litter6 Picasaweb page. 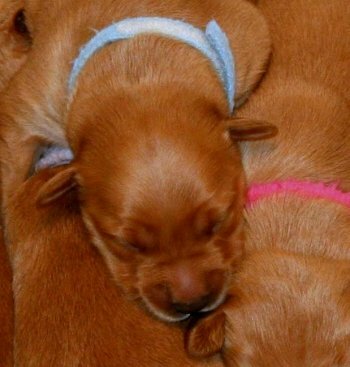 First picture of the new family, 5/29/11 at 1/2 day old.